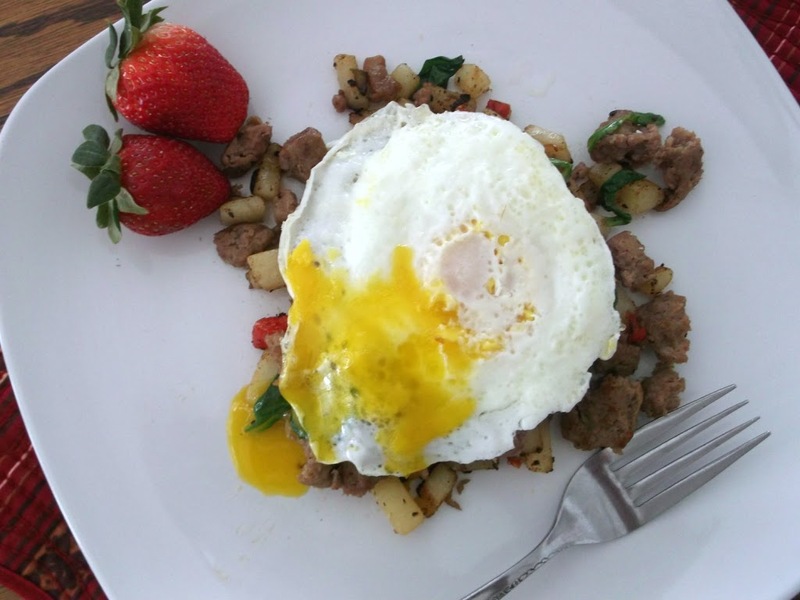 I have seen a lot of recipes for hash and always thought they were interesting. Usually they have meat with a variety of vegetables and usually served with some kind of egg, at least the breakfast ones. I never really thought about making one for my family, until now. This is the first time for me to cook with this type of sausage and I was really pleased with the texture and the taste. The only one that said they could tell a difference was Mike, but he didn’t mind the change too much. 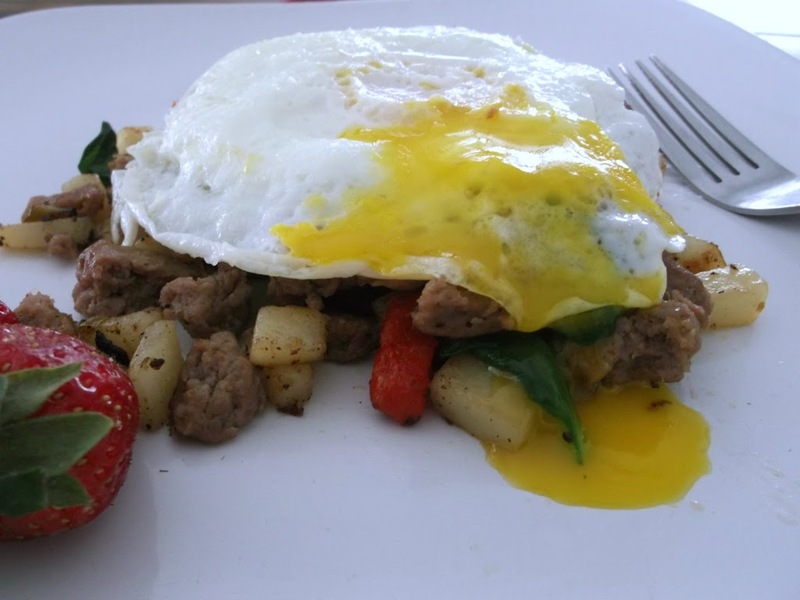 Added to the sausage was green and red peppers, onion, potatoes, some spinach, and to top it off an egg. I chose a fried egg, while others chose to go with scrambled. 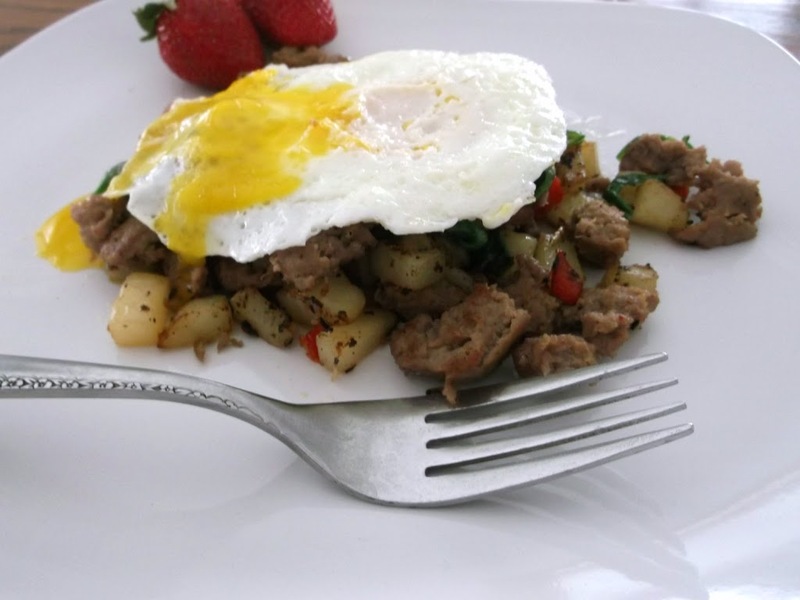 It doesn’t matter which type of egg you go with you will pleased with this tasty hash, great way to start a healthy day. Brown turkey sausage and cook on medium heat until it completely browned, stirring occasionally. While the turkey sausage is cooking chop peppers and onions into small pieces. Peel potatoes and cut into small cubes. Once the sausage is browned remove from pan and set aside. Add about a tablespoon of olive oil and add the peppers, onions, and potatoes cook over medium heat until potatoes are tender, about 15 to 20 minutes, stirring often. Salt and pepper you vegetables to taste as they cook. Once the vegetables are tender return the sausage to the pan along with the spinach; continue to cook for an additional 2 to 3 minutes just until the spinach is wilted. That is my kind of breakfast! It looks wonderful. I’m coming over for breakfast! 😉 Really nice – love a hearty breakfast like this, although I’d be more inclined to eat it for dinner (breakfast for dinner is one of my favorites). Great combo of flavors here. Thanks so much. How absolutely delicious! I never made my own hash before! This would make a great breakfast for dinner!